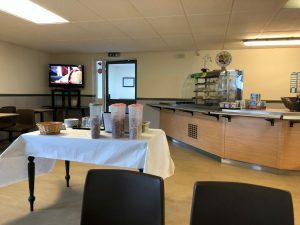 The Whitwood Café in Castleford, West Yorkshire, is part of the Exelby Truckstop chain and is a big facility geared up well to cater for truck drivers, offering good facilities and fuel services. The breakfast range starts with the small breakfast which comes with a rasher of bacon, a fried egg, beans, tomatoes, a hash brown and toast as well as a cup of tea of coffee. This is priced at £5. The standard breakfast is 90p more and offers a sausage, two rashers of bacon, two eggs, tomatoes, hash brown, toast and a brew. The mega breakfast has three sausages, three bacon rashers, two eggs, tomatoes, hash browns, mushrooms, black pudding, toast and a brew and is priced at £7.10. There is also the special breakfast which is the same price as the mega and comes with two sausages, two bacon rashers, two eggs, tomatoes, hash browns, mushrooms, chips, beans, toast and a brew. 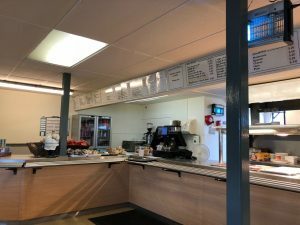 For those not wishing to have a full English breakfast, then there are a number of lighter options, including bacon and eggs at £3.40 or bacon and egg with either beans or tomatoes at £4. The simple beans on toast is £3.60, while two egg with beans on toast is priced at £4.10. Finally, two scrambled, poached or fried eggs on toast is £3.90 and the popular cheese on toast will set you back £3.60. There is also the option of a bowl of cereal at £1.70 or hot porridge at £1.50 a bowl. There are also a range of hot sandwiches including bacon or sausage which are both priced at £2.70, and if you want them with tomatoes then the price rises 10p to £2.80. A fried egg sandwich is priced at £2.50. Bacon or sausage baguettes are also available, and these are £4 each and for 20p extra they can come with either tomatoes or mushrooms. A range of omelettes is also available and a plain one is £5, while those with mushrooms, cheese or ham are all £5.20 each and a Spanish omelette is £5.50. Cottage pie or steak pie, which chips and veg, are both priced at £6 as is liver or sausage with onion and veg. For gammon, egg and chips, that will set you back £7.20 while the Farmhouse grill is £6.70. A 6oz burger with chips and beans will cost £6 while two eggs with chips and beans is £4.20, or £4 if you want it without the beans. Sausage or bacon with chips and egg is £4.70 and sausage chips and beans is £4.50. You can also order a pasty with chips and beans for £5. For those who like burgers then a plain beef burger (in a bun) with egg and chips is £6.20 and a chicken burger and chips is £5.60. A plain burger on its own is £3.70 while a cheese burger is £3.80. A bowl of chips on their own is £2.60. There is a range of specials available in the evening for £5, ask staff for details. You can also order a lasagne along with a pudding and a brew for just £7.20. A mug of tea costs £1.10 and coffee is £1.30. A glass of milk, cans of pop, or a glass of orange juice are all priced at 85p. There is a range of desserts such as apple pie, apple crumble, sponges and the like, which come with custard. There is also rice pudding on offer. There is a range of cakes, including caramel slices. The Whitwood café has free wi-fi and a bar serving a range of beers, wines and spirits. It seats over 120 drivers and if you are in a rush, or prefer to eat in your cab, you can have you meal as a take away. You can also ring (01977 517690) or e-mail in advance (order@buttyline.co.uk) to have your food ready for collection when you arrive. There are showers available which are open 0600-2045 Mon-Thu, 0600-2030 Friday and 0600-1100 Saturday. 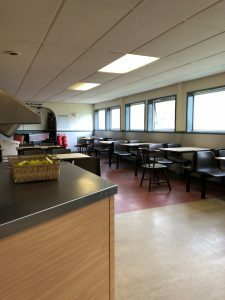 The café itself is open 0600-2045 Mon-Fri and 0600-1200 Saturdays. After 2100, the toilets are open in the bar area, and when the bar is closed, there are loos in the 24-hour forecourt shop. For drivers to relax, there is Sky TV and BT Sport showing big sporting events, including football, as well as a pool table and dartboard. 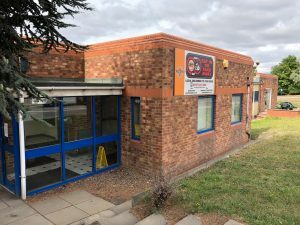 There is also a fitness and workout facility that is open 0600-2100 (0700-1300 on Saturdays) which offers personal trainers. You can use this on a pay as you go or a membership basis. 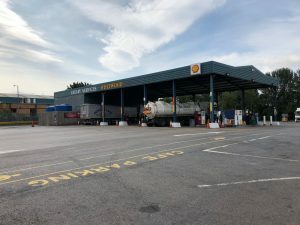 There is ample parking for trucks and also you can fuel your trucks 24 hours a day, seven days a week. When the café is not open there is still a 24/7 shop and access to toilets. Parking costs £16 a night which gives you a £4 meal voucher and the weekend parking rate is £13. It is £15 without the meal voucher or with SNAP. 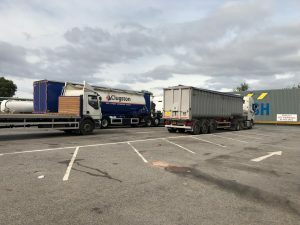 This is a big truckstop in the heart of a busy area for transport. Inside it’s clean and tidy and the food is good and value for money. The staff were also helpful and chatty.